To evaluate the complication rate in adult subjects with open cavities that were implanted with the Vibrant Soundbridge implant, using the round window (RW) vibroplasty procedure. 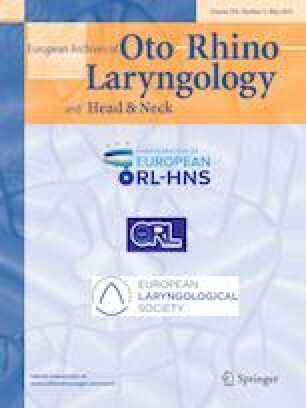 From 2009 to 2014, 21 adult subjects with mixed hearing loss, all with sequel from open tympanoplasty surgery, underwent RW vibroplasty (RW-VPL). Surgical complications were recorded and a standard minimal approach was used as a basis for all the cases that needed revision. The mean follow-up was 42 months (range 12–76). Complications occurred in nearly half of the cases and included: cable extrusion (23.8%), hardware failure (14.3%), profound hearing loss (9.5%), and inadequate RW coupling (9.5%). A minimal endaural approach (MEA) was used in the majority of the cases (86.7%), while the extended endaural approach was adopted for those patients requiring explantation with or without replacement (14.3%). RW-VPL can be considered a possible option for the rehabilitation of auditory impairment derived from an open tympanoplasty procedure due to cholesteatoma. The procedure may lead to minor/major complications that may require a surgical revision. By adopting an MEA, it has been possible to manage all the situations in which functionality of the device is worth being preserved.